Sant Iago (St. James), the patron saint of Spain and the first Christian martyr, is buried in Santiago de Compostella at the northwest tip of the Iberian peninsula. The Apostle James was beheaded in Jerusalem in 42 AD, and legend has it that the remains were transported by his disciples to be buried here. Stories of the discovery of the Apostle's tomb in the 9th Century brought pilgrims from around Europe, and the "Camino de Santiago" - Road/Path/Way to Santiago - soon became the most important Christian pilgrimage of the Middle Ages. On the "French Route", which is the most travelled, there are four main paths to Santiago, starting from Tours, Vèlezay, Le Puy, and Arles in France. These cross the Pyrenees at the Somport or Roncesvalles passes, joining at Puente la Reina in Navarre (near Pamplona) to form a single path across northern Spain to the saint's shrine at the Cathedral of Santiago de Compostella. The Spanish part of El Camino runs some 500 miles from the Roncesvalles pass through Puente la Reina, La Rioja, Burgos, Leon and Galicia. The Road to Santiago traverses some of the country's most spectacular landscapes, and is dotted with beautiful churches and chapels. 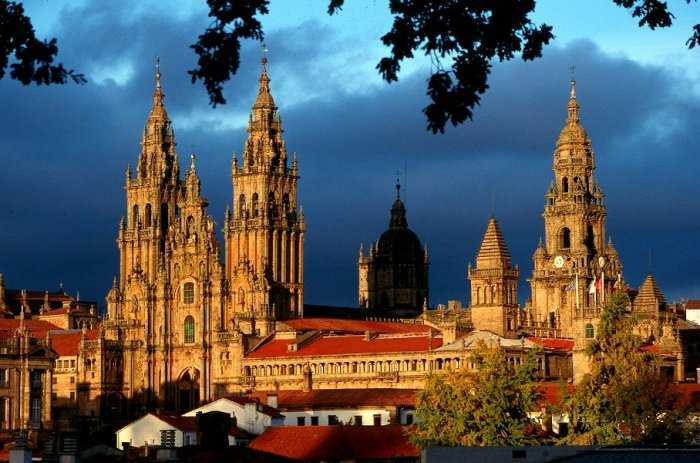 A proper pilgrimage must be made on foot, bicycle or horseback - the pilgrim has the use of free hostels along the route, and gets his pilgrim's passport stamped along the way and certified at the Cathedral in Santiago. The Apostle James the Greater, as he was called by Christian tradition, was one of the sons of Zebedee and Salome; his brother was John the evangelist, also Apostle. He was invited by Jesus "beside his brother and immediately after Peter and Andrew, to become fisherman of men". He was one of the apostles that had a close and intimate relationship with Jesus. He accompanied him when he began his mission. He was present in the Mount of Olives when Jesus predicted the destruction of the temple, the ruin of the city and the catastrophes that would precede the end of time, and he witnessed the last apparition of Jesus in Galilee after his resurrection. James died young, at 41 or 44, beheaded by order of King Herod Agrippa, who in an attempt to win the confidence of Rome, persecuted of the first Christians. According to tradition, after the death of Jesus, the apostles divided among them the places where they should predicate, and to James fell Spain and the occidental regions. After his martyrdom, his disciples carried his body by boat from Jerusalem to Iria Flavia, in Finisterre. On the seventh day of navigation they arrived at the mouth of the Ulloa river, in Galice. As they put the body of their master on a heavy rock, the rock melted like wax and turned into a sarcophagus. For more information on St. James Click Here. The history of the Comino dates back to the beginning of the ninth century, when the sepulchre of Santiago el Mayor (James the Greater), evangelist in Spain, was discovered. There is no written information about the precise circumstances under which the mausoleum was discovered. Its finders understood it as a divine revelation that a sanctuary was to be built where the remains had been found. In fact, there are indications that the sepulchre was venerated in remote times. Recent archaeological excavations have uncovered a Christian, a Roman and a Germanic necropolis in the subsoil of the Cathedral that date back from the first to the seventh century. Since its discovery, the grave and the cult it created became part of the cultural movement favoured by the Carlovingian Court of Aquisgrán, which laid the foundations for Medieval Europe. The find was such an important event that in many medieval paintings the Emperor Charlemagne is shown as playing an important role in the discovery. Along the routes to Santiago have walked people of all sorts and conditions: honest pilgrims, convicts, minstrels, beggars, adventurers, tramps, and fugitives from justice etc. The number of pilgrims increased when the Pope Calixto II established the Jubilee in 1122. This meant that all the penitent travellers who set out on pilgrimage in Holy Years (when the feast day, 25 July, fell on a Sunday) and fulfilled the requirements, would get jubilee indulgences. As a result, the number of pilgrims in the twelfth century rose to more than 200,000. Pilgrims have also left their marks along the Route, especially in Roncesvalles, where were built many monuments, including the famous Collegiate-Hospital in the French style -to cure the pilgrims´ wounds- and the graveyard for pilgrims of the Sancti Spiritus, from the twelfth century.